I 100% agree if it is officially gazetted as a National Park and one of the reason is, Mount Santubong is my first adventure when i was still in primary and secondary school, to be on the top of the mountain, to enjoy beautiful scenery of south china sea and sarawak river still a precious memory in my life.. and i would urge the Sarawak Government to build a cable car which similar to Gunung Matcincang in Langkawi. This could boost up tourism market in Damai area and to attract more tourists to come. Sarawak in the whole picture have more to offer compared to the neighbouring state Sabah.. but why are they become 1st choice of every foreigner travel to Borneo? time for Sarawak Government to wake up and look out to our sleeping tourism product yet to be discover by people out there. 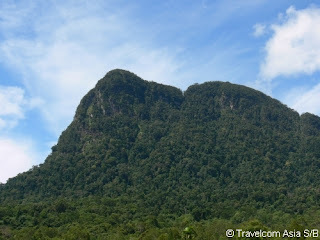 The Santubong area wasn't a national park before until a group of people move their influences to make this dream real and assure the protection of many species of plants and animals in dancer. Popularly known as the Mountain, the Observatory is highly placed at the tip of a mountain with two water reservoir tanks. It offers a scintillating bird’s-eye view that spans the entire school, the academic and non academic structures, and a pleasant scenery of abundant trees and enjoyable plant life.